If your clients feel imprisoned inside a large body, ever putting obstacles in their way of losing weight, then you can help them to break the shackles of their self-imposed confinement and enjoy the freedom of a healthier and slimmer body. There is a slimmer person waiting to be set free and enjoy life again and your clients can fit into the clothes they so adore, feel attractive and confident and comfortable with themselves and others. This is not just a dream - remember - what their mind can conceive they can achieve. 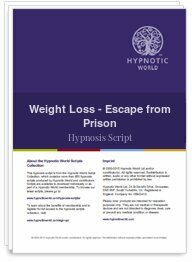 This 'Weight Loss - Escape from Prison' hypnosis script download could be the key for your clients' freedom from their weight prison.